One little difference that makes a big difference is possessing/acquiring CTS: Critical Thinking Skills and a fundamental part of Critical Thinking Skills is asking ambitious, focused, intelligent, provocative questions which in turn involves understanding the “Cycle of Inquiry”. 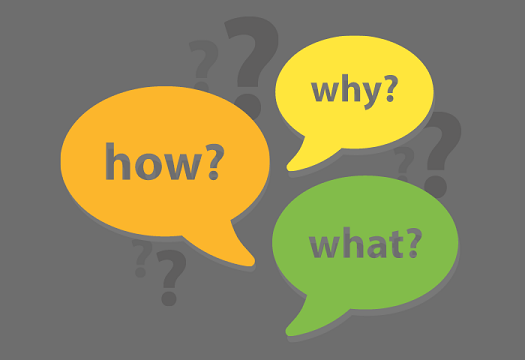 The Cycle of Inquiry involves sequentially asking “Why, What if, and How”, often over and over. Asking “Why?” or “What is Our True Goal?” focuses on the desired outcome, the ultimate purpose we wish to direct our energies toward, the underlying meaning of the inquiry. Why there is a problem, why it is a problem (for some or from another perspective it may not be a problem). Why it still exists i.e. why it hasn’t been solved already. Asking “What if?” or “How Might We?” or “What other paths lead to the mountain top?” helps us clear away obstacles in our minds, free our imaginations, and lets us see a different world. A variation of this is “Clean Sheeting” i.e. imagining that we are starting from scratch. We are building from the ground up versus attempting to modify an existing system or situation. If we were starting all over, what would we do differently? Asking “How?” or “What Would it Take?” leads us to the practical stage: creating action plans. When folks tell me something can’t be done, I sometimes ask, “Could you do it if you had a million dollars?”. Often the answer changes to, “Sure, if I had a million dollars I could.”. I then say, “Well, then it is possible, we just need to find a more economical, cost effective way to do it!”. Questions are the “Engines of the Intellect”, leading us to challenge the status quo and seek new, different and better ways. The act of formulating questions enables us “to organize our thinking around what we don’t know”. The most effective questions are open ended (i.e. do not contain presumptions or constraints), solution-focused, action-oriented questions that concentrate our creative energies on transforming possibility into reality.